"To all who come to this happy place; welcome. Disneyland is your land. Here age relives fond memories of the past ... and here youth may savor the challenge and promise of the future. Disneyland is dedicated to the ideals, the dreams and the hard facts that have created America ... with the hope that it will be a source of joy and inspiration to all the world." Anaheim, CA, July 17, 1955. Happiness. Dreams. Joy. Inspiration. Disneyland. How can I add anything more to Walt's wonderful opening invitation to Disneyland? It says it all. Furthermore, how can I begin to describe my love for Disneyland and all things Disney? From a very young age, up until today, I have been in love with fairy tales and storytelling, and Disney was a master. Not only that, but I loved (and continue to love) to draw. In junior high, I decided I wanted to be a Disney animator when I grew up and, out of love for one of my beloved artistic innovators (or should I say "imagineer") I changed my cursive capital D to mimic that of Walt Disney's signature/logo. I still sign my name that way. When I was in college, I went to an art gallery showing of the original cells and hand-painted backgrounds from Snow White, the world's first full-length feature cartoon. They were breathtaking. I geek out on the Doombuggies website, and read up on everything there is to know about the creation of my favorite ride. I'm not a super-fan, in the sense that my home isn't covered with all things Mickey Mouse (although I do have a few pieces of memorabilia and collectors items). I just appreciate the ideals Disney strove for, both in his movies and at his park, his craftsmanship, his innovation, his art, his creativity, his storytelling. 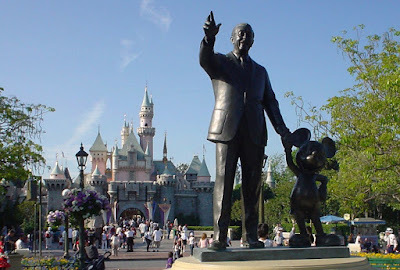 So when I visited Disneyland for the first time, at about eight years old, I was a combination of shocked, giddy, and overjoyed, to discover that those magical places from all the storybooks and movies were embodied in a real place. There were no bullies in Disneyland, and I was a princess, no matter what I looked like, and the magic was real. Even if I knew we were still playing pretend, it was the most wonderful, glorious, elaborate game of pretend I'd ever played. An interviewer once asked Walt Disney what his favorite moment was out of all his animated films, and he said it was the scene when Cinderella gets her ballgown. That feeling of awe and wonder, beauty and magic and possibilities - that's what Disneyland feels like. It sounds cheesy - the happiest place on earth, a place where dreams come true - until you get there, and see it for yourself. From every little enchanted flower in the landscaping, to the smiles and pleasant attitudes of each "cast member", to the attention to detail and gorgeous art and thinking outside of the box by the Imagineers on all the rides and attractions, to the full-on commitment the costumed cast members take towards their roles, it all adds up to an environment where you can just let go and dream and have fun. You truly can be a kid again. The park holds everything any kid's imagination has ever longed for: you can run away with pirates and search for buried treasure on the high seas, sneak into a haunted house, fly over London with a pixie, ride a space ship into the future, visit an enchanted castle, brave the dangers on safari through a treacherous jungle, tame the wild west, ride a real locomotive. It's a kid's dream come true. Each time I've gone back to Disneyland, at different ages throughout my childhood, in college, even for my honeymoon, and just recently as an adult, each experience has been shaded in different magical hues and has been uniquely special. Is it escapism? Yes, most definitely, but it is a type of escapism that reminds you of the good things in life, the things to strive for. On my most recent trip, it was towards the end of the day when I realized I had gone all day without worrying about anything (this is an earth-shattering feat for me, a hard-core worrier and all-around fret-box). Yes, all my troubles would be waiting for me when I got home. I wasn't in denial about that, but for one day, the burdens were gone, and I was just a kid, dreaming about possibilities. 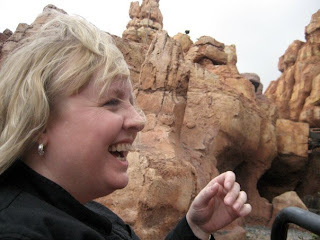 Disneyland reminds us of the potential good in each of us, to overcome adversity and find joy. It reminds us to take time just to laugh and have fun. It brings out the kid at heart. I smiled so much that day, my face ached. This song always makes me think of my apologetics-practicing husband, and the people he ministers to on a daily basis. He's good at asking people questions, to get to the bottom of what their stumbling block is with coming to Christ, and sometimes (as I think is the case in this song) it comes down to a matter of the heart. You can give all the facts and proofs and arguments for the Truth of scripture and Christ and the gospel story, and people still will choose not to believe, because there is an emotional issue keeping them from surrendering. Often times, with friends, after I've answered argument after argument that they've brought up about God, and they're still not satisfied, I've wanted to ask them the same thing Nichole does in this song..."aren't you tired of running away from God?" I saw Nichole Nordeman in concert, and she told the story behind this song, "What If", before she played it and I wanted to include that story here. In fact, if you're interested, I found an article online, here, with her discussing the meaning behind all her songs on the Brave album. (I love the album and highly recommend it!) I also want to point out that, although I agree with her that no one was ever "argued" into the arms of Christ, I would clarify that idea slightly, and say there's a right way and a wrong way to talk to people about issues of faith and Truth. It doesn't have to be a heated argument, but that also doesn't mean you can only talk about your faith in an emotional sense. There are good reasons for my faith, and there's nothing wrong with sharing them in a loving way, being respectful and tender to the heart of the person you're talking to. I also think different things bring people to Christ. Sometimes it is an intellectual argument, sometimes it's an emotionally powerful event in their lives, most times it's a combination of the two (always with the working of the Holy Spirit). The good news is that Jesus meets you where you are. "For God so loved the world that He gave His one and only Son, that whoever believes in Him shall not perish but have eternal life." (John 3:16) Happy Easter indeed!. So here's her story behind the song, in her own words, with the video and lyrics following. I’ve never felt comfortable arguing about God. That’s not to say I haven’t done it. Trust me, I’ve engaged in more than my fair share of full blown, take-your-corner, gloves up, ten full rounds of Bible beating with people. It’s so embarrassing and humiliating to remember. Especially since my victims probably never set foot in another ring, (and not because I was such a formidable opponent, I just had this nasty habit of always hitting below the belt). Winning an argument for God was a big deal... But I don't argue anymore. Nobody ever got argued into the arms of Christ. Nobody gets brow beaten or humiliated into a relationship whose very foundation is mercy and grace... When every argument and piece of well defended evidence sounds empty to a hurting heart, it is the love of Jesus that comes rushing in and changes things. I wrote this song for a friend who I believe strongly will run out of arguments one day, and straight into the arms of Jesus. BEWARE! HERE THERE BE SPOILERS! Don't say you weren't warned. Now that we've got that out of the way, let's talk LOST! A huge tsunami-type wave lifts the Black Rock up and crashes it into the Taweret statue, destroying it! Everyone has a different level of comfort, when it comes to watching a magician on stage. There are some who are dying to know how he did it, and will not rest until the illusion is explained and all mystery expunged from the trick, then there are those who, even though they know it is a trick, are willing to play along with the deception, and are comfortable just reveling in the the mystery and the magic of it and being entertained. I think I fall more into that latter category. I am hoping that LOST answers the big questions to this massive story, and wraps up major plot lines in a satisfying way, but I'm alright with it if they don't ever fully explain all of it, like why the numbers are magical, for example. They just are, and I'm okay with that. I'm okay if they don't explain every little mysterious detail about the island. Once you explain all the mystery away, it rubs away some of that magic fae glitter, and leaves a dull spot. So, having said all that, I had no expectations that they would ever explain how the statue was destroyed, and was pleasantly surprised by this. I was also a little surprised to find out that Hurley wasn't talking to Jacob, but instead, it was Isabella he was communicating with. 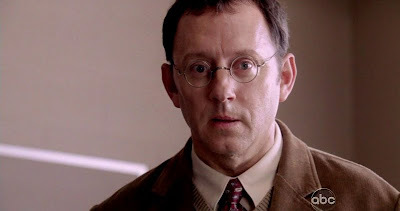 Hurley seems to be a more effective Ghost Whisperer than Miles. I'm glad Hurley has embraced this gift, instead of freaking out and assuming he was having a relapse of mental illness whenever he saw dead people (although who could blame him?). Isabella: "It wasn't your fault that I died, Ricardo. As much as you wanted to save me, it was my time. You've suffered enough." Richard: "I would do anything for us to be together again." Isabella: "My love, we are already together." It sounds like a cheesy romance novel, with the words just written down like that, and taken completely out of context, but what a powerful, heart-wrenching scene this was, when Richard was able to talk to the ghost of Isabella through Hurley. Nestor Carbonell was able to show what an amazing actor he is and he made me believe every single moment of that scene - and he did it with his eyes closed - literally! I seriously hope he gets offered some major acting roles after this show concludes. I wouldn't mind seeing more of his acting chops. I also appreciate the artistry the director/cinematographer took with filming the scene so that Hurley faded out and we could savor the intensity of the moment. Ilana: "So Richard, what do we do next?" So, there it is. I think if I had to rank my top three favorite episodes of LOST, it would be #1 The Constant (Desmond's time travel episode), #2 Through the Looking Glass (Charlie's Death) and #3 Ab Aeterno! LOST, while not overtly a Christian show, per se, has very much toyed around with Christian themes throughout the show. This show especially brought those themes to the surface again. The Man in Black continues to remind me of satan, in the way he speaks to and interacts with people. His offer to Sayid reminded me of the same way satan spoke to Jesus, when tempting him in the desert. And the way he manipulated Richard, taking on Isabella's form to mess with him, was just cruel (and also similar to what he did with Mr. Eko). My other Lostie friends immediately thought of baptism when Jacob started dunking Richard into the ocean, so that he would realize he is alive. The agreement the Man in Black has with Jacob also is starting to remind me of the book of Job and how satan asked God for permission to tempt and test Job. My Lostie friends also came up with the idea that Jacob is an angel (maybe Michael? ), sent to guard over satan and keep him trapped on the island, and that's why he can't directly influence the mortals in their choices. Maybe the island is Eden and the skeletons we're calling "Adam and Eve" really are THE Adam and Eve? Whoa. One last freebie tidbit for you: the title of the show, "Ab Aeterno" is Latin for "from eternity". The phrase is used to mean "since the beginning" or "for long ages". What are your theories, on the overarching plot of the show? Does it seem like they are starting to build up to the ultimate finale, or are you still frustrated and unsatisfied with the plot? Leave me a comment and let me know - we have less than 24 hours to discuss until the next revelation! Progressive rock expands past rock's technical and compositional boundaries by going beyond the standard rock or popular verse-chorus-based song structures. The arrangements often incorporate elements drawn from classical, jazz, and world music. Instrumentals are common, while songs with lyrics are sometimes conceptual, abstract, or based in fantasy. Progressive rock bands sometimes use concept albums that made unified statements, usually telling an epic story or tackling a grand overarching theme. In the case of Nightwish, they have a female opera singer for the lead vocalist, are a traditional rock band full of electic guitars and pounding drums, yet they also encorporate a lot of orchestral/symphonic accompanyment, and each song tells a fantastical story. This music is the soundtrack for my happy place. I love it. Don't say you weren't warned. Now that we've gotten that out of the way, let's talk LOST! How appropriate in the alternate universe that, as Sawyer put it, he got to the point in his life where he was either going to become a criminal or a cop, and he chose cop. It was initially shocking to see the man we know as the con-man acting on the right side of the law, but it makes perfect sense. 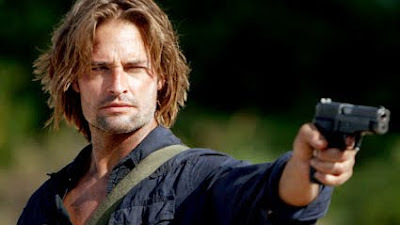 I've always had a hard time forgiving Sawyer for the nasty things he did when they were first on the island (season 1). The conning, the double-crossing, the selfishness, the monopolizing of supplies, the hurtful name calling: I really hated him. He was a manipulative bully, out for no one but himself. And even though they've done a nice job with his character arc and he has become the reluctant hero, has broken down his walls and learned to love, etc. I still have a hard time liking his character. I guess I'm holding an imaginary grudge against an imaginary character, huh? That's funny. But, I think I could like the sideways-universe Sawyer. He uses his skills for good instead of wrong (although he was still a colossal jerk to Charlotte). Claire finds Kate and makes a heartfelt and teary apology for attacking her. Sawyer returning to the bear cages and seeing Kate's dress. Poor Claire. I feel really bad for her. She lost her baby, went crazy, was stuck in solitude on a creepy island for three years, and is being lied to and manipulated by the Source of All Evil. I really pittied her in that moment, where she apologized to Kate and broke down in tears. I think Emilie de Ravlin did a great acting job in this scene, showing Claire struggling to break through the crazy. I've never been totally engaged by the Jack-Kate-Sawyer triangle. Don't get me wrong, I don't mind a little romantic relationship stuff thrown into the mix. I cried like a baby when Juliet died, when Sun and Jin broke thru their problems and restored their marriage, when Rose and Bernard were reunited, etc. I'm just saying that I don't hang on every twist and turn of the on-again off-again thing between Skate or Jate or whatever people call that triangle. But I must say, I was a little nostalgic and sad, seeing Sawyer at the bear cages. Not for the same reasons he was sad, about his lost love with Kate, but I was nostalgic for the days of the show when we didn't know quite who Dharma/The Others were, Jack was in a shark room, Sawyer and Kate were in the bear cages, and everything was tense and dark, and Ben was in his element, manipulating all three of them. This show has had some amazing writing, and even more amazing acting, over the last several seasons. Sigh. I'm gonna miss this show. Sawyer to Charlotte: "So you're kinda like a female Indiana Jones?" A few more random thoughts - I loved seeing Liam Pace at the LAPD station, to bail out Charlie after he got arrested for drugs on the plane, but what was Liam doing in LA? In the original timeline, didn't Charlie fly to Australia to try and convince Liam to get Driveshaft back together? If Liam was in LA, does that mean Driveshaft never broke up? I know it doesn't matter to the greater scheme of things, but inquiring minds want to know. Also, did you catch that Charlotte works for Miles' father at a museum? I love how all their lives are intersecting, whether they are on the island or not. It's clever to see how the writers do it. And I'm sure none of you were surprised that Sawyer is playing both sides of the field, and is conning both Smokey and Widmore, to his own gain. He's always looked out for number one. An interesting sidenote (something I read on Lostpedia, so I can't take credit for it.) Is that the episode was called "Recon", which has one obvious definition, when Smokey sends Sawyer on a reconnaisance mission to Alcatraz, but it could also mean to re-con, to con again. Cool, huh? We know the statue that Jacob resides in is of Taweret, the hippopotumus goddess. In Egyptian mythology, Taweret was the goddess of fertility and childbirth. But she was seen, in a greater sense, as a protector of life. People would put little statues of her above the doorframe of their house. She was described as one who protected against evil by restraining it. When asked "What lies in the shadow of the statue?" Richard replied, "He who will save us all." So that describes the Taweret/Jacob camp. During this episode, Smokey told us that his mother went crazy. If we're assuming that both he and Jacob are not human, and that the writers are using Egyptian myth as a touchpoint for their story, then I wonder if Jacob's mother was Sakhmet. Sakhmet (lion/cat goddess) was a fierce hunter and goddess of destruction and wrath. She went on a killing rampage to destroy all humans and was so wild with bloodlust the other gods, even the head god, Ra, couldn't stop her. They finally turned the Nile to beer, then dyed it red so it would look like blood. Thinking it was blood, she drank it, passed out, and that's how they finally stopped her. Nice, huh? Not much to say about this band except that they consistently rock. We purchased a RED CD for one of our friends recently, which got me to thinking about the band, and led me to posting them for my Musical Interlude Monday. RED is a Christian rock band, with their name representing the color of Christ's blood, and also being short for "redemption". This song, "Breathe Into Me", was their first single, which received a lot of airplay on the mainstream rock radio stations here in town. Which, as an aside, is typically how I found out about new Christian rock music. The so-called Christian music stations in my area only play the adult contemporary, shiny happy Christian music, which is fine, if that's what you're into, but not really the repository for all things Christian and rock... Anyway, here's the song... I hope you like it. This was a terrific Ben-centric episode, and I was completely engaged and invested with the flash-sideways universe's plotline as much as I was with the island plotline. I really am loving the alternate universe. It was so interesting, the parallels and double and triple meanings that the writers wove into that portrayal of Ben. Three cheers for excellent writing! I'll definitely be re-watching that episode. Here are my favorite moments from the show. Jack: "I have no idea why, but I'm willing to bet you if Jacob went through all that trouble, that he brought me to this island for a reason, and that it is not to blow up sitting here with you here right now." Richard: "That's a pretty big risk your taking." Richard: "What if you're wrong?" Jack used to be the "man of science", while Locke used to be the "man of faith". Looks like the little incident at the lighthouse finally convinced Jack of Jacob's powers and he has now completely switched over to being a man of faith. I was quite shocked. I guess Jack had an epiphany when he was taking that little time-out to stare out at the ocean. It's an exciting development to his character, and I think the writers have done a good job of showing his slow transition to this way of thinking, with his choosing to return to the island, with detonating the bomb, etc. I also loved to see a little bit more of Richard's reaction to all the events that have transpired and felt bad for him. It's interesting that he's unable to kill himself. It reminded me of when Michael escaped with Walt and became suicidal when he was off-island, but no matter what he did, his suicide attempts never worked. Then Mr. Friendly found him and told him the island "wouldn't let him die." When Michael was back on the freighter, trying to keep the bomb frozen until everyone could get off, Christian Shephard (a.k.a. Smokey? a.k.a. Jacob?) appeared to him and said, "You can go now." and then the bomb blew up. Hmmm... lots to chew on there. As an aside, there was another shocking moment in this week's show and that was when we saw the submarine with Widmore in it, (although I assumed he was the person Jacob was referring to when he said someone was coming to the island). What's he up to? How did he find the island? Ben: "I watched my daughter Alex die in front of me and it was my fault. I had a chance to save her but I chose the island over her. All in the name of Jacob. I sacrificed everything for him, and he didn't even care. I stabbed him. I was so angry. Confused. I was terrified that I was about to lose the only thing that had ever mattered to me - my power - but the thing that really mattered was already gone. I'm sorry that I killed Jacob, I am. And I do not expect you to forgive me because I can never forgive myself." Ilana: "Then what do you want?" Ben: "Just let me leave." Ilana: "Where will you go?" Ben (in tears): "Because he's the only one that will have me." I never ever ever thought I'd ever have sympathy for Ben. I think back to those days when he was Henry Gale, locked in the gunsafe in the hatch. How manipulative and evil he was, and how much I hated him. After all the atrocities he has done, all the manipulation and heartache, even when Alex died, I never thought I'd cry for Ben. This show changed that. Again, I think the writers have done a good job of slowly tearing him down, tearing away all the things he used to rely on, to leave him completely broken and exposed, so that he finally, sincerely, repented of his evil ways - his lust for power. I think his apologies and confessions up to this point weren't 100% authentic, because he was still holding back, they were still a little self-serving. He had to hit rock bottom figuratively and literally (in digging his own grave) to finally get it. I cried when Ilana showed him grace, and told him she would have him on her team. I also cried when in the flashsideways world, he chose to protect Alex over his own selfish wants and his own desire for power (an active illustration of what the island Ben just now figured out). It's hard to forgive horrible people, such as the Ted Bundys and Hannibal Lectors of the world, of which I would include Ben in that group, but what a powerful example of Christian grace, to forgive those who don't deserve it, when they sincerely repent. I don't know if the writers are coming from that worldview or not, but that's how I interpreted the scene, and why I think it had such power. Other heartbreaking moments in this episode were: the scene with Richard, who was so broken, and feeling as if his dedication and service to Jacob were all for not, and the classic slow-mo montage set to music with the reuniting on the beach. Yes, we've seen it a bunch of other times. It used to be a LOST end-of-episode standard. But it's been a while since they've used this, and I wasn't ready for it. It still got me all teary-eyed. Jack (to Richard after the TNT fuse burns out): "Want to try another stick?" Ben: "The things people will bring on a plane!" It seems as if multiple "candidates" are rising to the occasion. Ever since the whole "candidates" concept was introduced, I've been thinking Hurley would be the one, because he's always been pure of heart, but now Jack seems to be rising to the occasion and maybe... even... Ben? Why do you think Ilana forgave him and accepted him into the fold? She's obviously very hurt that he killed her god/mentor/father-figure. Does she know he's actually a candidate? Or did she do it simply because it was the right thing to do? What did you think about Miles's revelation, when he told Ben that he was wrong about Jacob being indifferent about dying? He said "right up until the second the knife went through his heart, Jacob was hoping he was wrong about you." Could Jacob see past all the hurt and horrible choices in Ben's life, and see the potential in Ben to be good and do the right thing? How does Widmore figure into the plot as it stands now? What a long strange journey its been, and it isn't over yet. Leave me a comment and let me know what you think. I've talked about Blue October before on my blog, and today I was in the mood for this particular song. Blue October is an American rock band and each member has varied musical backgrounds or influences. Combine that with a healthy collaborative effort, and within one album you could have a great pop tune, a trippy techno type song, a hard rock jam, or a beautiful tender ballad. I know describing them in that way makes them sound like a hot mess, but somehow, magic happens, and they make it work. And how cool is it that they use a violin in beautiful and ingenious ways in almost every song? Love it. The song I picked for today's post is "A Quiet Mind", and even though the lyrics are a little surreal, I understand the overall emotion or expression of the song, of how being with someone you love can be a comfort in the midst of stress or when you feel out of sorts. I feel like I need to quiet down my anxious mind today, so that's what reminded me of this song. The video is from their live DVD called "Argue with a Tree". I've seen them in concert, and they are just as amazing in person as they are on their albums. I call baby up. Leave me alone. Nadia is married to someone else in the flash-sideways reality. When Sayid stabbed the Nemesis, it didn’t kill him or even draw blood. Sayid turns to the dark side, and kills Dogen and Lennon. Jin is in the freezer! The plot twists and revelations were flying fast and furious during this episode. I can’t count how many times I sucked in a breath, in shock over what just happened or was shown to us. I understand that things are the same, yet slightly askew in the alternate universe, but for some reason I didn’t think Nadia would be married to someone else, let alone Sayid’s brother. Her hands were unscarred, and the picture he had of her was different, so it seems like their whole background story is different, even though it seems like Sayid’s background as a torturer for the military is the same. I’ve always liked Sayid. Ah, who am I kidding? I’ve grown fond of all of the original survivors, and even some of the newer cast additions, on different levels throughout the last five seasons (except for Shannon and Michael; they both drove me nuts). Sayid’s instinct and judgment has always been spot-on, and he was always a strong hero, and had even had regret for the torturing and negative aspects of his past. So I must say I’m a little disappointed that he has gone evil and joined Team Smokey. I’m hoping that he’s a double-agent, but I think that’s a slim chance. As far as Nemesis not dying when Sayid stabbed him, I really didn't think he would (because then it would be the end of the show) but I was surprised that Sayid actually did it, and creeped out that it didn't seem to leave a mark or draw blood or anything. Which, I guess I shouldn't be surprised about that either since Nemesis is an apparition, and isn't actually using Locke's physical body. I was also surprised that the act of violence didn't trigger him to go into Smokey mode and kill Sayid, like it did when Braum and his crew shot at him. As an aside, Keamy is a jerk no matter what timeline he is in, isn't he? Nemesis: "Sayid, if you'll do this for me... what if I told you that you could have anything you wanted. What if I said you can have anything in the entire world?" As I was watching this scene, I was instantly reminded of the temptation of Christ in the desert. "Again, the devil took him (Jesus) to a very high mountain and showed him all the kingdoms of the world and their splendor. 'All this I will give you,' he said, 'if you will bow down and worship me.'" (Matthew 4:8-9) Again... I'm so sad that Sayid made the decision to go with Team Smokey. But just like the devil, the Nemesis knows how to tempt people at their most vulnerable point. He did the same thing with Sawyer. He approached him when he couldn't get any lower (emotionally) or more broken, then offered him the one thing he wanted above all others. Miles: "Sawyer sent you packing huh? I thought about going after him too, but I knew he’d just end up berating me until I turned around and came back. Is that what happened?" Miles: "Well, welcome back to the circus." Frank: "We'll play catch up later. You wanna live you better move your a**." Thank goodness for the few lighter moments, where we could find them, because this was a very dark episode! I have a few more random thoughts. Did you see Sayid and Nadia pass Jack in the hallway of the hospital? Interesting, to find out that Dogen had a "job" assigned to him by Jacob. He must have been a protector of some kind or gatekeeper, because once he was dead, the protective ash circle didn't matter, and Smokey had free-reign into the temple. Not only did I see Biblical parallels in the "temptation of Sayid" but I also felt like the ultimatum given at the temple had echoes to the passover of the Bible. Poor Kate is getting in on the tail end of all these goings-on and she has no idea the levels of psychopath crazy that she’s walking into, not only with Claire but with Not-Locke. Last she knew, Locke was dead. So as far as she knows, this is Locke resurrected. Argh! So many things to discuss, my fingers can't type fast enough. 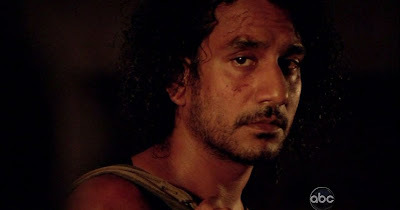 Leave me a comment and let me know what you think about Sayid and his decision, and the direction the story is taking. And until next week, I leave you with this creepy final scene, and that sweet lullaby turned psycho creepy horror movie theme song. Scary! Anberlin is an alternative rock band, whose members all just happen to be Christian. They dislike being labeled a "Christian band" since doing that limits their audience and reach of impact. Plus, the lead singer has said, "My faith affects every single aspect of my life..." So labeling them a Christian band seems silly and unnecessary (except to the marketing world, of course). I mean, we don't refer to people as a "Christian Secretary" or "Christian Mechanic". On an interesting side note, the band Fall Out Boy said in an interview that they did not really know much about Jesus until Anberlin toured with them. I think that's pretty cool. I hope they continue to have an influence, not only with their fans, but with the people they meet in the industry and tour with. This song, "Feel Good Drag", was their first single, and one of my favorites. I hadn't thought about this band in a while, until one of their songs popped up on my random iPod playlist. All their albums have been solid, and I encourage you to cruise around on YouTube to listen to some of their other songs. Enjoy!